A few drops taken daily supports the body`s nervous system and water balance, for optimum energy and wellbeing. 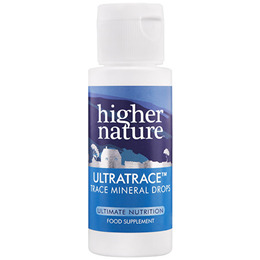 UltraTrace is suitable for those on normal or sodium restricted diets. CONTAINS NO added sugar, salt, starch, soya, wheat, gluten, yeast, maize/corn, lactose, dairy products, artificial preservatives, colours or flavourings. A naturally sourced concentrated solution of ionised minerals. Adults take with meals, diluted in 250ml of water, juice or herbal tea. Dose according to bodyweight: over 75 kilos (12 stone) - 30 drops, 50-75 kilos (8 to 12 stone) - 20 drops, 25-50 kilos (4 to 8 stone) - 10 drops. Children ages 3 to 8 years, take 5-9 drops in 150ml water. Intake can be spread through the day. Below are reviews of UltraTrace - Trace Mineral Drops - 227ml by bodykind customers. If you have tried this product we'd love to hear what you think so please leave a review. Very happy with the purchase. Great product, very pleasant taste without exessive sodium. Easy to use. I cannot tolerate vits/minerals in tablet form so this has been a real boost for me. I would recommend it for anyone with similar problems. This premier trace mineral supplement from the Great Salt Lake is naturally sun-dried and provides, in minute amounts, most of the naturally occurring minerals, in perfect balance, and in ionic form for optimum absorption.